Rearing pullets means growers must be aware of all the management practices that make a healthy, reproductive bird. A productive breeder hen must hit a target weight by a particular age and have proper body conformation in order to be stimulated into egg laying. Flock uniformity is crucial to a productive hen house. A flock that’s uniform in size comes into production better, peaks higher, and persists better. Grading breeder hen pullets will help create a more uniform flock and should be done as early as possible. Once in the hen house, growers still need to be aware of body condition and bird weight so they can be effectively brought into lay. Without these being on target, birds cannot respond to light stimulation. 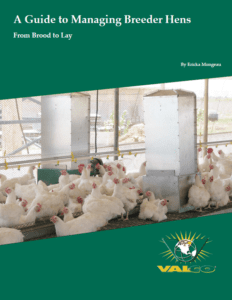 Rearing breeding pullets and hens can be an ongoing challenge. Be sure to spend time in the barn, observe the flock dynamic, handle them regularly, and weigh them often. The best way to achieve great production is to practice great animal husbandry.